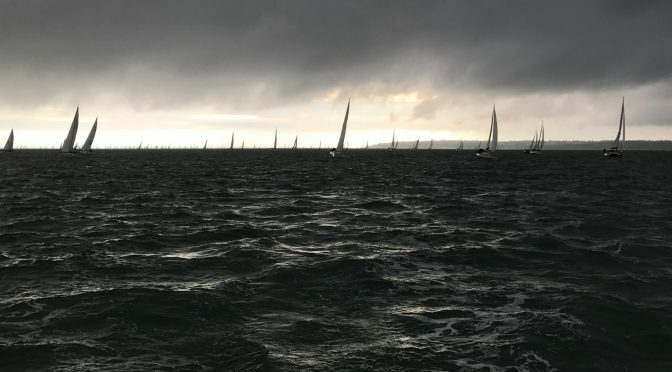 The crew had been looking forward to this year’s Round the Island Race for months and finally we assembled Thursday evening in readiness for training hard on Friday. Most of have sailed together in each race since 2011 and sailing is what brings us together – so it was great to catch up. 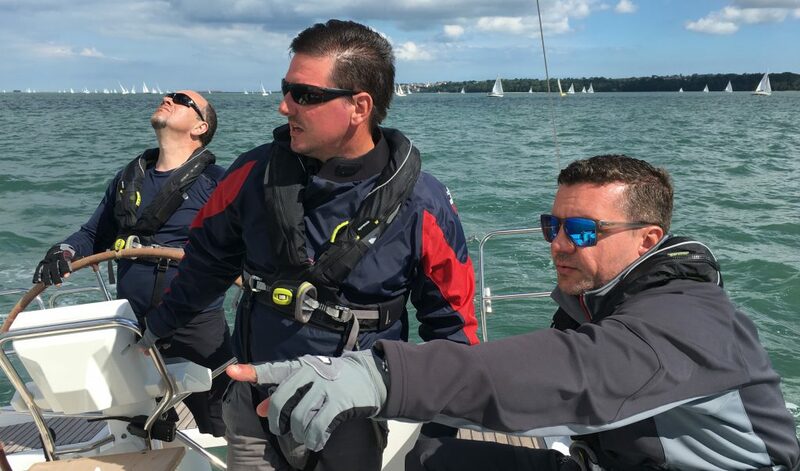 Friday was the day to get to know our yacht and our training went very well – we had our reefing evolutions down to 45 seconds and were shaking them out in just 25 seconds. Our tacks and gybes were very fast and reliable. We felt ready. Most of our practise though was with the cruising chute – certain to be an essential given the forecast. 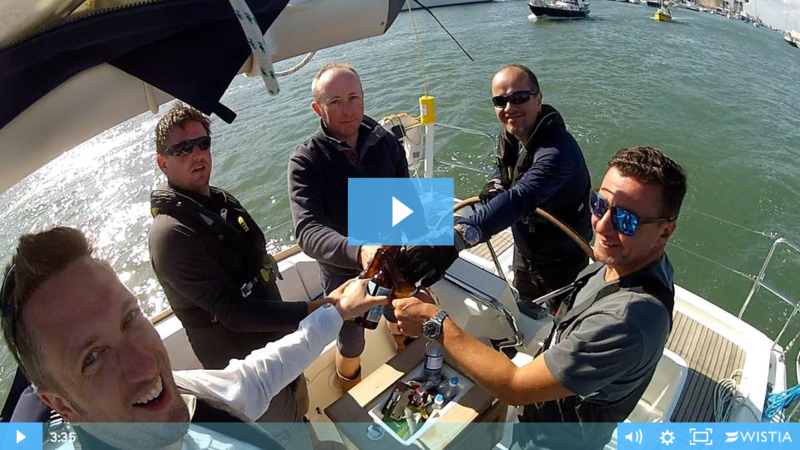 We hooked up with ‘Nomad 1’ for lunch in Osborne Bay – our competition for Saturday. 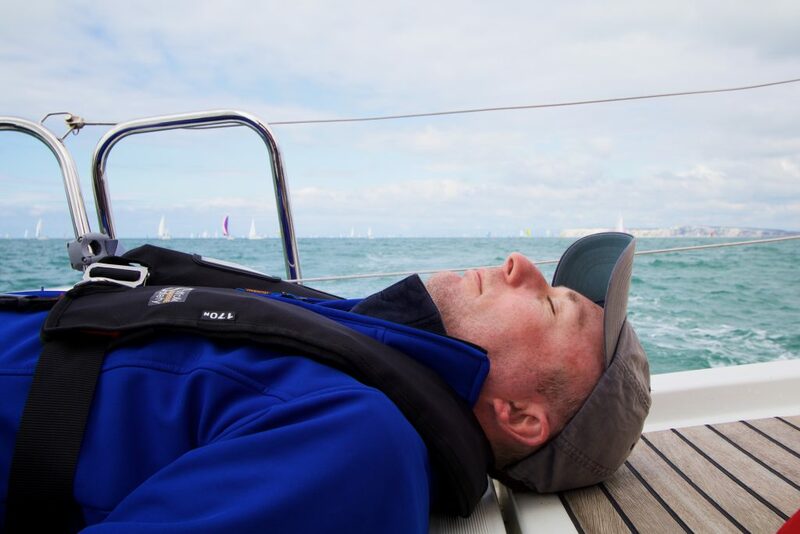 Lou Barden, Chief Instructor at Nomad Sailing, was skippering her and having taught us all to sail, we were as keen as ever to beat her – almost as keen as she was not to be beaten, I’d say. We spent Friday evening at the Folly Inn finalising race tactics. The plan was to stay with the fast tide down to the Needles and turn late to cross past the wreck itself. Then we would go closer inshore to avoid the worst of the foul tide along the back of the Island. For the beat back from Bembridge we would also hug the shore and avoid the strong ebbing tide. We were up bright and early at 0450 to get ourselves ready. As we made our way up the Medina with dozens of other yachts the excitement was building. 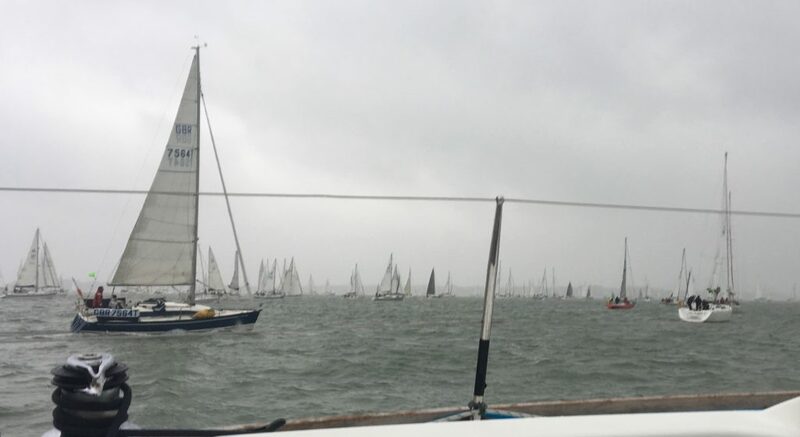 As we entered the waiting area in the Solent the wall of yachts in all directions was epic. Gets you every time. It was drizzly and raining as we crossed the start. Not being experienced inshore racers we were about 2 minutes late over the line. 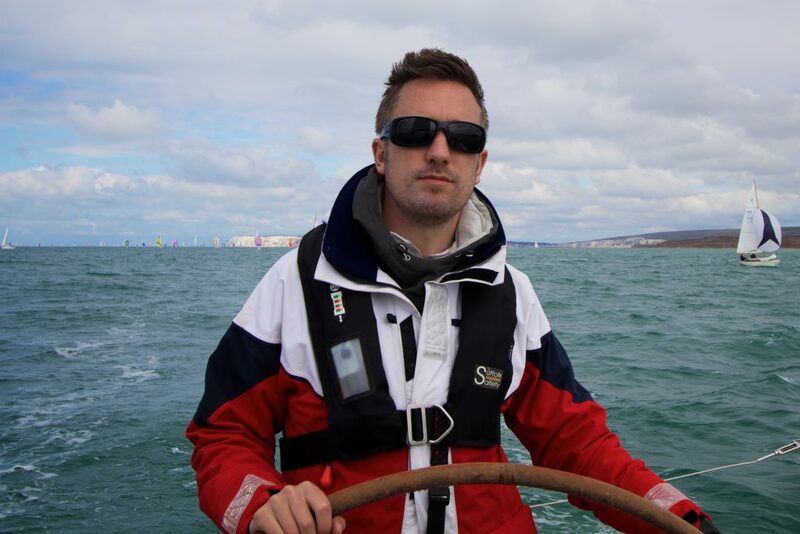 It ended up being a single reach down to the Needles and as we came through Hurst Narrows we topped 10 knots. Our tactics were to maximise speed through the Shingles and then turn to cross the Needles at just the right distance to avoid the wreck. On reflection, we should have come in closer (see the track below) as the extra distance outweighed the benefit. We could have come closer to the wreck too. ‘Nomad 1’ was well behind us all the way but made up a good deal of this distance coming in much closer to the Varvassi. It looked to us that they’d sailed right over it but the track shows they were very safely clear (about 2 cables) and we had been far too cautious (at 4 cables). Shortly after, we were hoisting cruising chutes and in no time they were way ahead of us. We played with our cruising chute to see what difference we could make and stayed with our inshore plan. Although we crossed the Needles 2 minutes before them, they made up for it by finishing this leg 5 minutes faster and then again on the third leg to Bembridge. We had a calamity with the cruising chute during a gybe where is was wrapped around the forestay. Instead of dropping it, going back to the jib and then repacking and hoisting we spent an eternity trying to unravel it. We were using the tracker (and receiving lots of text reports from friends and family telling us we were losing!) and were convinced that was it – game over. They rounded Bembridge ECM 7 minutes ahead of us. As we wrestled the twisted cruising chute straight into the forepeak cabin, Pete opened the hatch and jumped through to pull the sail down. I then reattached the sheets and halyard to the rails and moved swiftly back to the cockpit. I hadn’t closed the hatch (I could say “we” hadn’t, but you can’t reach for it from inside so this was down to me). As I moved briskly back I stepped straight onto the non-existent hatch door and face planted full force onto the deck smashing my hip. I hit it with a hell of a whack and it hurt. Fortunately, I got away with it when you think it could have easily ended up with a broken leg or ribs. We live and learn. 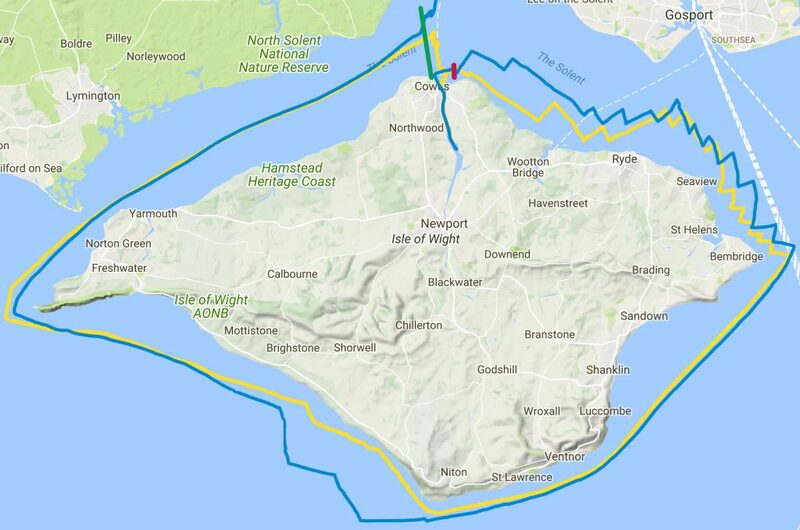 As we rounded the Bembridge Ledge ECM we started the long beat up to Cowes. We knew we’d been fast down to the Needles so if we had any chance of catching them it would be on this leg. Although we could see them way ahead on the tracker it’s not a precise plotter and difficult to judge where they were. We agreed to give it everything and we worked hard on the tacks and kept ‘Avant Garde’ close inshore to avoid the foul tide. As we came up towards St. Helen Fort we spotted them in the distance – the distinct Nomad logo a giveaway. Now it was getting exciting – they were in reach and we could tell we were making ground – the race was back on. We knew they would know the same and we bet it wouldn’t be the same feeling we had! As we passed Ryde I realised that I’d never been that close to the pier before. We took turns helming and rotated crew around the winches. We could tell visually and from the tracker that we were gaining on ‘Nomad 1’ and we felt certain our tactic of keeping inshore while they seemed to go in the deeper water was paying off. As we closed in on the finish line on port we were forced to tack away and kept on that line for longer than we needed. 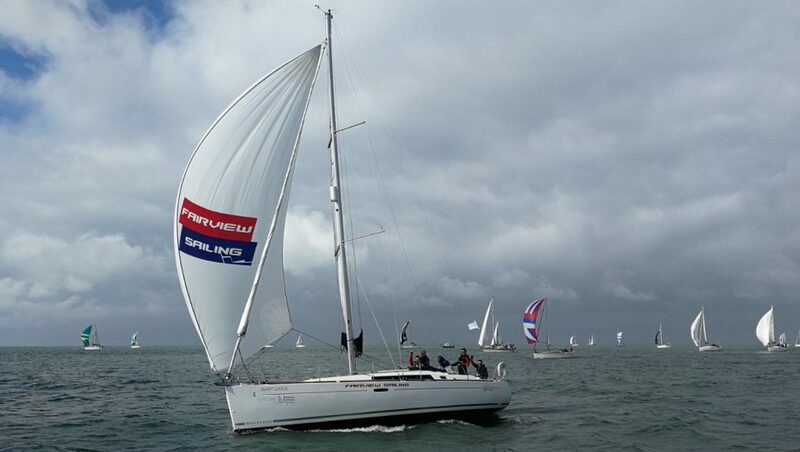 ‘Nomad 1’ came down on a long starboard tack to the finish line and was held back from tacking into the finish line. It seemed we might just make it. It was not to be and Lou was able to tack and cross the finish line 2 minutes ahead of us. 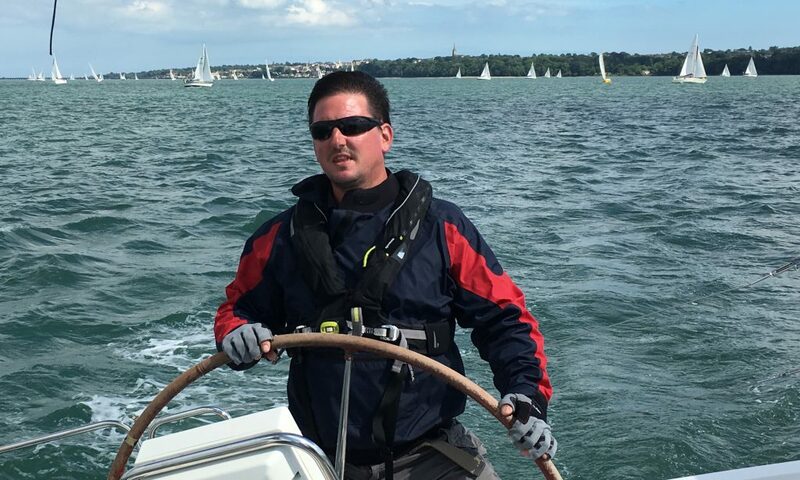 10 hours to round the Isle of Wight is a long time – made to feel even longer when we read a new record had been set when Skipper Ned Collier-Wakefield and his team finished the 50-nautical mile race in two hours, 22 minutes and 23 seconds. Impressive stuff. Previous PostRound the Island Race 2017 VideoNext PostHow did ‘Windchat’ measure up for it’s IRC Rating?